Given that there is no no app that can tell you exactly the ambient temperature around you, the Thermodo temperature sensor by Thermodo is really a neat idea! The Thermodo above in the picture is the premium version one which is made from anodized aluminium and has engraved Thermodo. Thermodo comes in one piece attached to a keyring and un-clips in two pieces by simply pulling it apart to reveal the actual temperature sensor which plugs into the headphone jack of your Android or iPhone device. Before you can start using it you need to download the free Thermodo app from Google Play or iTunes Apple Store. As you launch the Thermodo app, you will be presented with an user guide that goes over some basics of the Thermodo. 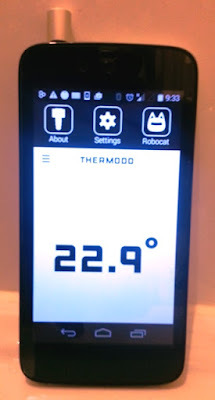 Then, simply insert the Thermodo into the audio jack of your phone and a temperature reading shows up instantly. The menu of the app consists of three options: about page and settings. 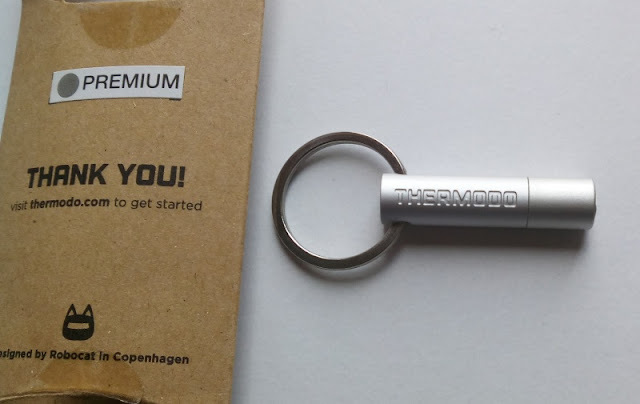 The about page has more information on the Thermodo as well as a link to the Thermodo website where you can order additional Thermodos. The settings option allows you to change the Thermodo Celcius default to Fahrenheit, as well as turn on "Compensate for device heat", which essentially gives you a more accurate temperature reading by lowering the temperature measurement to compensate for the heat coming off your smartphone. You can also turn off and on the "show indicator arrows", which are Black arrows that appear as temperature reading becomes hotter or cooler. In the few days or so I had to test the Thermodo, the temperature reading was accurate when compared to the temperature readings of my external temperature I have in my flat. To test for drastic temperature changes, I placed the Thermodo in a hot room and then took it outside to see the instant reaction to the different temperature changes. Also, if you slide the screen up, you will see the current measurement screen which shows the "low", "average" and "high" readings of past usage.